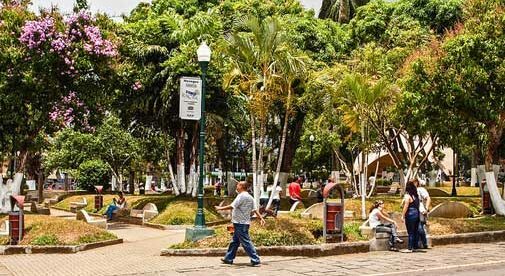 The main plaza in the town of Grecia, Costa Rica. After vacationing in Costa Rica for 10 years to visit her brother (a resident of the country), Rebecca Harlien decided it was time to pick up roots in her Magnolia, Texas home and plant them in Grecia, Costa Rica. A real estate agent in Texas, Rebecca saw the opportunity to sell her house while there was a boom in the market five years ago and then reinvest her profits on property in the Calle Rodriguez area of Grecia. At the time, Calle Rodriguez was a burgeoning area with abundant acreage property in a jungle-like setting. It has since developed to become a popular area for expats who want a secluded getaway in the hills above Grecia. Rebecca restructured her Grecia home to include plenty of outdoor space. Rebecca was able to find a property with over an acre of land and two existing houses, one of which she has renovated into her custom retirement home, and one is in use by her brother’s family. With the help of a local lawyer and notary, she bought the entire property for $130,000. 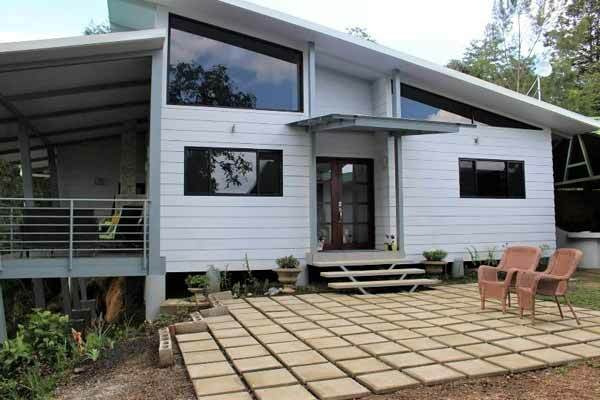 With a six-month timeline for the reconstruction of her house, Rebecca rented a small house in the town and hired an architect to design her open concept contemporary house, complete with cathedral ceilings throughout the living area, and a two-bedroom, two-bathroom floorplan. The architect also arranged for the foreman and construction crews to complete the work in the December-to-May timeframe. The estimate from the architect for the rebuild was $60,000, which seemed like a bargain for the work to be done. However, while construction was underway, Rebecca became aware that the fine print of the estimate did not include the cost of any of the custom woodwork or windows. This added to the cost of the project and the timeline was in jeopardy since the custom nature of these materials were beyond the scope of six-months. It also increased the price of the project to $150,000. The materials used for the construction were single-sourced by the foreman, but for the personal touches that Rebecca wanted, she imported light fixtures and drawer hardware from the U.S. Also, in her plans were extensive flower gardens and rock walls throughout the property. When May rolled around, the house was completed except for her permanent doors which were being custom-built. They were installed in July. The result is a cozy and airy house with balconies and patios for abundant outdoor living. A stroll through the gardens displays Rebecca’s flair for local color, rustic borders, and creative vegetable gardening mixed into the landscape. 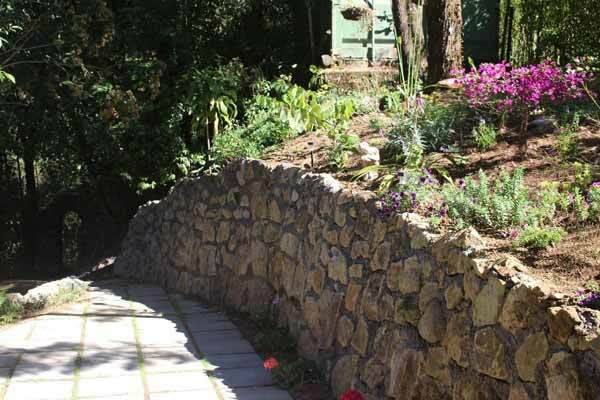 Rustic stonework and creative planting are the main themes in Rebecca’s colorful garden. Reflecting on the experience, Rebecca says, “While the end-product is my vision, I would have liked to have been more hands-on in the daily management of the contractors and suppliers. There was some reluctance of the construction crew to take suggestions from a woman, which is sometimes common in Latin America, but with the help of a translator and my brother, I was able to overcome this obstacle.” She also cautions others who might be considering any construction project in Costa Rica to make sure that the architect and contractor quotes are all-inclusive to minimize cost overruns. Looking at the popularity of the neighborhood and the new construction that has taken place in the area over the last five years, Rebecca estimates that her return on investment would be roughly $400,000. But that is not in the near future as there is always another glass of wine to be enjoyed on the patio watching the spectacular sunsets from her dream home.